IS IT GOOD TO BE SECOND TO THE LAST OF 10, OR TO BE BELOW AVERAGE 15 TIMES OUT OF 16? Superintendent Bailey and other members of our school administration, send regularly letters to the Editor of "Random Harvest" where they claim that they are providing a good education to our students. Most people who have class, would hesitate to write such self-serving stories. To separate fact from self-serving fiction, look at the New York State Department of Education statistics below! They were printed in the June 29, 2003 issue of the Star Gazette. 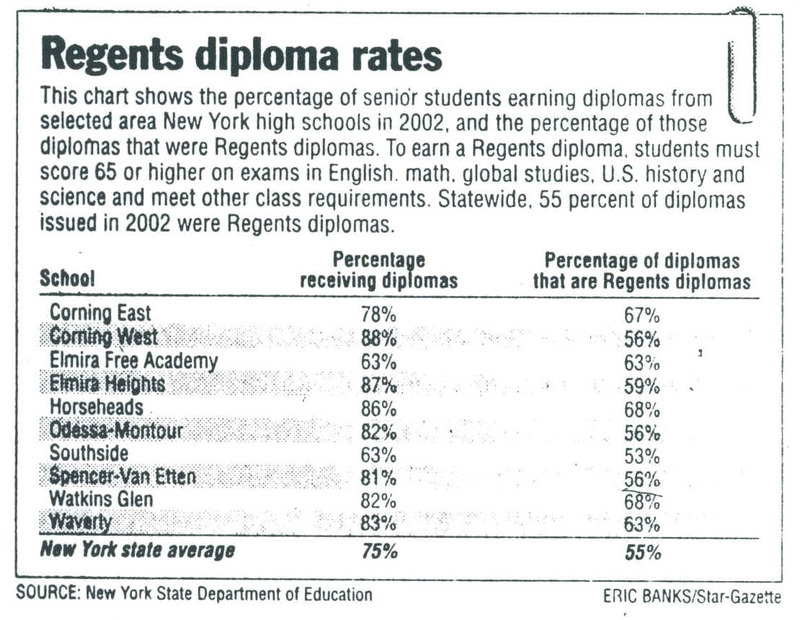 Of ten local school districts, our district is second to last when it comes to earning Regents diplomas! Instead of resigning, to let better skilled people take over, our superintendent is still bombarding the public with his self-serving material.. The unacceptable test results cover many years. . Click here to see how we have done in the state mandated tests in the past. Out of 16 tests we were below the state average in 15 when compared to similar students.